On October 31, the Supreme Court (SC) overruled a 2010 verdict assigning the death sentence to Asia Bibi, a Christian woman accused of committing blasphemy in 2009. The bench comprising three judges cited a lack of evidence to uphold the death sentence and called for her release. Following the verdict, Islamist parties led by the Tehreek-e-Labbaik Pakistan (TLP) organized mass protests against the verdict in major cities, including Islamabad, Lahore, and Karachi. Until November 2, city centers were severely paralyzed by blockades on arterial roads, commercial activities were suspended, and multiple incidents of vandalism, such as the burning of tires or vehicles, were recorded. Prime Minister (PM) Imran Khan made a public address defending the court’s verdict on October 31. He also warned that the government would take strong measures in the case of road blockades or acts of vandalism by Islamists while condemning the verbal attacks against the military and judiciary by protest leaders. During the evening hours (local time) on November 2, the TLP agreed to end its street campaign following a five-point agreement between the Pakistan Tehreek-e-Insaf (PTI)-led government and the organization’s representatives. In return, the government agreed to include Asia Bibi on the Exit Control List (ECL) to prevent her from leaving the country, as well as to not object to a review petition against the acquittal. The government also agreed to release all individuals arrested in relation to the three-day-long protests. On November 4, the Minister of State for Interior Shehryar Khan Afridi announced the Federal government’s decision to launch legal proceedings against protestors that engaged in acts of vandalism, as well as those that posted provocative content on social media. Legal proceedings against the TLP leader and founder Khadim Hussain Rizvi, senior leader Afzal Qadri, and workers were registered, while Hussain Rizvi’s social media account was suspended for an indeterminate period of time. On November 1, the Tehreek-e-Taliban Pakistan Jamaat-ul-Ahrar (TTP-JA) militant group released an audiotape featuring its leader Omar Khalid Khorasani, condemning the overturning of the death penalty and calling on Pakistanis to rise against the “un-Islamic state”. On the same day, the Hizbul Ahrar (HuA) group, an offshoot of the TTP-JA, claimed that it will continue to target those that strengthen Pakistani judicial institutions. On November 3, the Tehreek-e-Taliban Pakistan (TTP) released a statement condemning the SC’s decision, while the Islamic State Khorasan Province (ISKP) released a poster threatening Asia Bibi and Kurt Westergaard, a Dutch cartoonist known for his controversial drawing of Prophet Muhammad. While various religious and conservative parties organized nationwide protests against the court’s ruling, the three-day street agitation underlined the TLP’s growing position as a major opposition figure to the incumbent government. Well-established religious parties like the Jamaat-e-Islami (JeI) and the Jamiat Ulema-e-Islam Fazl (JUI-F) also organized similar demonstrations. However, TLP-led protests attracted considerably higher turnouts and occupied the most prominent locations within urban centers, often becoming a rallying point for smaller Islamist groups. The media attention that those demonstrations received, as well as the government’s decision to sign an agreement solely with TLP representatives, further underscores the prominent position enjoyed by the Islamist party during the demonstrations. Recent legal proceedings against high-profile political figures, such as the Pakistan Muslim League-Nawaz (PML-N) leader Shahbaz Sharif and the former PM and PML-N leader Nawaz Sharif, appear to have aided the TLP’s growing political clout. The erosion of public confidence in these individuals over allegations of graft likely created more space for relatively newer opposition parties to enhance their platforms, within which the TLP seems to be championing the populist cause of blasphemy. This assertion is backed by an opinion poll conducted during the general elections held on July 25, which revealed that 46 percent of the sample of TLP voters interviewed had voted for the PML-N in the 2013 general elections. The seeming increase in the TLP’s political capital can also be tied to the perceived victories the platform has achieved in recent months. Most notably, in November 2017, a three-week long protest campaign at Islamabad’s Faizabad interchange against the alleged softening of blasphemy laws ended with the resignation of the then PML-N Minister for Law and Justice Zahid Hamid. Since August 2018, under the PTI’s tenure, the TLP also succeeded in securing the removal of the PM-appointed Ahmadi economist Atif R Mian from the Federal government’s Economic Advisory Council. Additionally, the cancellation of a cartoon contest about Prophet Muhammed in the Netherlands was also likely seen as a TLP victory by local actors, given the group’s vocal opposition to the contest and its rallies in relation to the matter. The party’s focus on religion and the branding of its platform as a defense of Pakistan’s identity likely resonates with those concerned about the perceived growth of Western influence and the associated dilution of Islamic values. Given that the PTI previously joined the criticism by Islamist parties against the alleged endorsement of Western values by the then ruling PML-N, PM Imran Khan’s perceived failure to uphold Islamic tenets is liable to further bolster the ranks of the TLP. FORECAST: Over the coming months, the TLP will likely continue to galvanize support in urban centers by organizing disruptive demonstrations regarding matters of religion. However, party leaders are liable to refrain from making harsh statements against the military establishment, in order to avoid a tough response by the security apparatus. Asia Bibi-related protests represented the first major challenge to the PTI since it came to power in July. Given PM Imran Khan’s defense of blasphemy laws during his election campaign, the PTI likely opted for a cautious strategy to end the protests, in order to avoid alienating its own supporters. The agreement between authorities and the TLP leadership, while expressing support for the verdict, seems to be aimed at maintaining support within both the PTI’s conservative and liberal electorate. The November 2 agreement was widely perceived as a capitulation to Islamists’ pressure by the PTI. Such criticism derives from the perceived contradiction between the PTI’s statements in support of the verdict, and the acceptance of key demands put forth by protestors. The agreement to launch legal proceedings to add Asia Bibi’s name on the ECL also contradicted with a PTI statement posted on social media on November 1, denying such intentions. Despite the criticism, the PTI will likely claim to be successful in removing protestors from the streets in the span of three days. In contrast to the November 2017 protests during which the then ruling PML-N called on the military to dislodge TLP workers, the PTI government secured a retreat without an overt military involvement. It will likely focus on the limited use of force to dispel the gatherings to drive home its point. FORECAST: The government’s balancing act on the issue is likely to engender sustained criticism from mainstream political parties. This will also encourage the TLP to continue pursuing intimidation tactics in order to advance its political agenda. 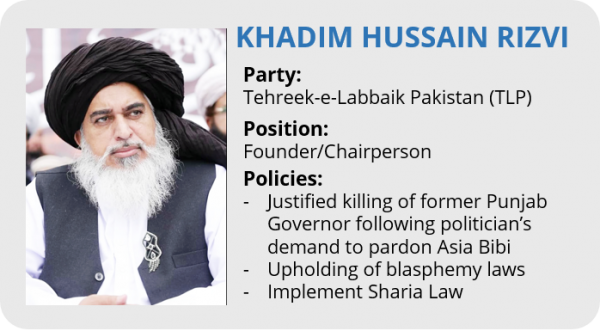 The charges levied against TLP leaders, and the suspension of the social media account of Khadim Hussain Rizvi allegedly following governmental pressure on the social network, are likely to be perceived by members of the organization as a breach of the agreement signed on November 2. Such legal crackdowns, if sustained, bear the risk to further radicalize the organization’s supporters, as they may increasingly perceive the PTI-led government as deceptive. In return, an increase in anti-state sentiment is liable to elevate the risk of lone-wolf attacks carried out by more hardline TLP members. This is anticipated given the continued sensitivities surrounding blasphemy-related matters. A TLP member was allegedly involved in the attempted assassination of the then Interior Minister Ahsan Iqbal in May over his remarks regarding blasphemy laws. This further highlights the potential for acts of violence against political, security and judicial institutions in the near term. The TLP’s rhetoric during the protests, especially its calls to target members of the judiciary and to revolt against the military’s highest officials, heightens this risk. The statements against the SC verdict by militant groups are likely aimed at projecting relevance amid the current national discourse on the perceived erosion of Islamic values. FORECAST: The Asia Bibi case is likely to increase sectarian tensions over the coming months. Groups such as the TTP-JA or ISKP, known for their sectarian rhetoric, are liable to carry out attacks against religious minorities such as Christians and Ahmadis, who are often targeted over accusations of blasphemy. 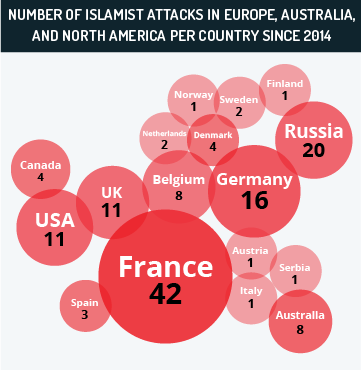 There also remains an elevated threat of militant attacks against political and judicial figures over the coming months, by both lone-wolf actors or militant groups. In addition, given the perception that Western countries exerted influence over the judiciary proceedings in favor of Asia Bibi, anti-Western sentiments are likely to increase. Particularly, the potential granting of political asylum to Asia Bibi by a Western country is likely to be met with strong opposition and protests by local residents. Anti-Western sentiment is expected to be directed at the US, Canada, or the UK, as these countries were mentioned in the video recorded by Asia Bibi’s husband seeking political asylum. Negative sentiments towards the Netherlands are also likely to be elevated, given the previous controversy surrounding the Dutch cartoon contest, and reports that Asia Bibi’s lawyer will seek asylum in the country. 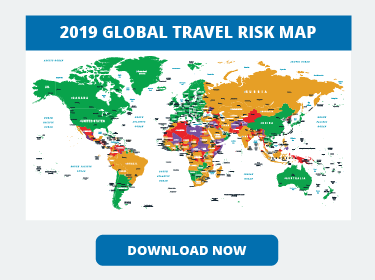 We advise against all non-essential travel to Pakistan given the heightened threat of militant attacks, criminality, kidnappings and sectarian tensions throughout the country. As a general precaution in travel security, maintain heightened vigilance in the vicinity of security detachments, government buildings, public areas, diplomatic installations, news stations, military bases, restaurants, high-value soft targets like schools, shopping centers, and religious centers including mosques as they remain potential targets for militant attacks. Given the sensitivity of blasphemy-related matters, avoid overt or critical statements of government, religious, or judicial institutions both in public spaces and online, including social media. Avoid demonstrations or political gatherings, especially in relation to the Asia Bibi verdict, given the potential for unrest or escalations into violence. Over the coming months, we advise maintaining vigilance in the vicinity of Christian places of worship or Christian-related gatherings given the potential for retaliatory attacks against minority communities in light of the SC acquittal. Foreign nationals are advised to maintain a low profile and exercise heightened vigilance over the near term anti-Western sentiments associated with the case. 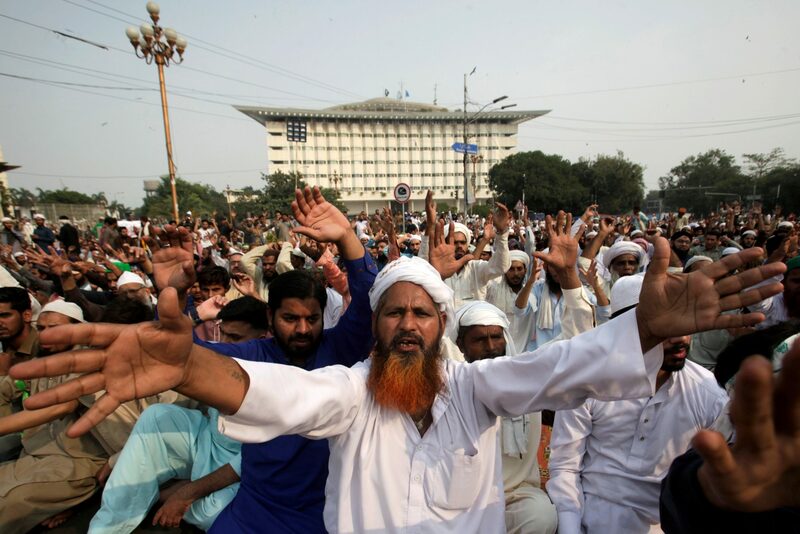 Hey Buddy!, I found this information for you: "Asia Bibi-related protests underscore TLP’s growing political influence; blasphemy case to increase radicalization – Pakistan Analysis". 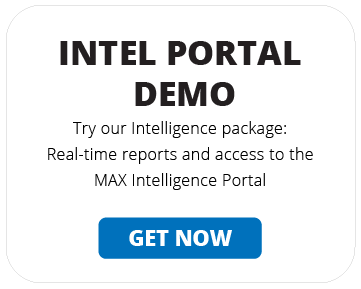 Here is the website link: https://www.max-security.com/security-blog/asia-bibi-related-protests-pakistan-analysis/. Thank you.